Historical Ink's Reproductions of antique maps of cities, towns and villages. Reproductions of old maps of towns in Vermont from the county atlases published in the late 1800s. Addison County maps are reproduced from the Atlas of Addison County, published in 1871 by F. W. Beers. Bennington County maps are reproduced from the Atlas of Bennington County, published in 1869 by F. W. Beers. Caledonia County maps are reproduced from the Atlas of Caledonia County, published in 1875 by F. W. Beers. Chittendon County maps are reproduced from the Atlas of Chittenden County, published in 1869 by F. W. Beers. Franklin County maps and Grand Isle County maps are reproduced from the Atlas of Franklin and Grand Isle Counties, published in 1871 by F. W. Beers. Lamoille County maps and Orleans County maps are reproduced from the Atlas of Lamoille & Orleans County, published in 1878 by F. W. Beers. Orange County maps are reproduced from the Atlas of Orange County, published in 1877 by F. W. Beers. 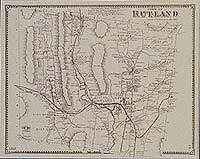 Rutland County maps are reproduced from the Atlas of Rutland County, published in 1869 by Beers, Ellis & Soule. Washington County maps are reproduced from the Atlas of Washington County, published in 1873 by F. W. Beers. Windham County maps are reproduced from the Atlas of Windham County, published in 1869 by Beers, Ellis & Soule. Windsor County maps are reproduced from the Atlas of Windsor County, published in 1869 by F. W. Beers. 353 Items. Showing Items 1 thru 50. This historical old Addison County map was reproduced from the Atlas of Addison County, Vermont (VT), published by F. W. Beers in 1871. VTAD08 1871 OLD MAP: Inset map of North Ferrisburgh village, Vermont (VT). This historical old Ferrisburgh map was reproduced from the Atlas of Addison County, Vermont (VT), published by F. W. Beers in 1871. VTAD10 1871 OLD MAPs of villages of Ferrisburgh Centre, Monkton, Burnumtown & Monkton Ridge, Vermont (VT); Monkton Business Notices. This historical old Monkton map was reproduced from the Atlas of Addison County, Vermont (VT), published by F. W. Beers in 1871. This historical old Starksboro map was reproduced from the Atlas of Addison County, Vermont (VT), published by F. W. Beers in 1871. This historical old Panton map was reproduced from the Atlas of Addison County, published by F. W. Beers in 1871. VTAD18 1871 OLD MAP of Vergennes village, Vermont (VT). Reproduced from the Atlas of Addison County, Vermont (VT), published in 1871. VTAD19 1871 OLD MAP of Waltham, Vermont (VT); inset of Vergennes P.O. This historical old Waltham map was reproduced from the Atlas of Addison County, Vermont (VT), published by F. W. Beers in 1871. This historical old New Haven map was reproduced from the Atlas of Addison County, published by F. W. Beers in 1871. This historical old Bristol map was reproduced from the Atlas of Addison County, Vermont (VT), published by F. W. Beers in 1871. VTAD24 1871 OLD MAP of Village of Bristol, Vermont (VT). This historical old Lincoln map was reproduced from the Atlas of Addison County, published by F. W. Beers in 1871. This historical old Addison map was reproduced from the Atlas of Addison County, Vermont (VT), published by F. W. Beers in 1871. This historical old Bridport map was reproduced from the Atlas of Addison County, Vermont (VT), published by F. W. Beers in 1871. This historical old Cornwall map was reproduced from the Atlas of Addison County, Vermont (VT), published by F. W. Beers in 1871. This historical old Middlebury map was reproduced from the Atlas of Addison County, Vermont (VT), published by F. W. Beers in 1871. VTAD33 1871 OLD MAP of Middlebury village, Vermont (VT). This historical old Ripton map was reproduced from the Atlas of Addison County, Vermont (VT), published by F. W. Beers in 1871. VTAD37 1871 OLD MAPS Inset maps of villages of E. Middlebury; Granville; Granville centre & Ripton, Vermont (VT). This historical old Granville map was reproduced from the Atlas of Addison County, Vermont (VT), published by F. W. Beers in 1871. This historical old Shoreham map was reproduced from the Atlas of Addison County, Vermont (VT), published by F. W. Beers in 1871. This historical old Whiting map was reproduced from the Atlas of Addison County, Vermont (VT), published by F. W. Beers in 1871. This historical old Salisbury map was reproduced from the Atlas of Addison County, Vermont (VT), published by F. W. Beers in 1871. This historical old Leicester map was reproduced from the Atlas of Addison County, Vermont (VT), published by F. W. Beers in 1871. VTAD44 1871 OLD MAPS Inset maps of villages of Salisbury, Leicester & Hancock, Vermont (VT); Salisbusy & Leicester Business Notices. This historical old Goshen map was reproduced from the Atlas of Addison County, Vermont (VT), published by F. W. Beers in 1871. This historical old Hancock map was reproduced from the Atlas of Addison County, Vermont (VT), published by F. W. Beers in 1871. This historical old Orwell map was reproduced from the Atlas of Addison County, Vermont (VT), published by F. W. Beers in 1871. Reproduced from the Atlas of Bennington County, published by F. W. Beers in 1869. This historical old Rupert map is reproduced from the Atlas of Bennington County, Vermont (VT), published by F. W. Beers in 1869. This historical old Dorset map is reproduced from the Atlas of Bennington County, Vermont (VT), published by F. W. Beers in 1869. This historical old Peru and Landgrove map is reproduced from the Atlas of Bennington County, Vermont (VT), published by F. W. Beers in 1869. This historical old Sandgate map is reproduced from the Atlas of Bennington County, Vermont (VT), published by F. W. Beers in 1869. This historical old Manchester map is reproduced from the Atlas of Bennington County, Vermont (VT), published by F. W. Beers in 1869. VTBE14 1869 OLD MAP of Insets of Dorset Centre; West Rupert Center, Factory Point & Peru Center, Vermont (VT). This historical old Winhall map is reproduced from the Atlas of Bennington County, Vermont (VT), published by F. W. Beers in 1869. This historical old Arlington map is reproduced from the Atlas of Bennington County, Vermont (VT), published by F. W. Beers in 1869. This historical old Sunderland map is reproduced from the Atlas of Bennington County, Vermont (VT), published by F. W. Beers in 1869.